On August 1, news of a bitcoin "hard fork" broke the cryptocurrency world. Traders were flung into uncertainty and many started wondering about the new Bitcoin Cash and what it means for the market. Should you invest in Bitcoin Cash? Why fork Bitcoin rather than just using a pre-existing cryptocurrency? Will there be more drastic price changes in the different cryptocurrencies? Will the value of bitcoin be diluted? What comes next? 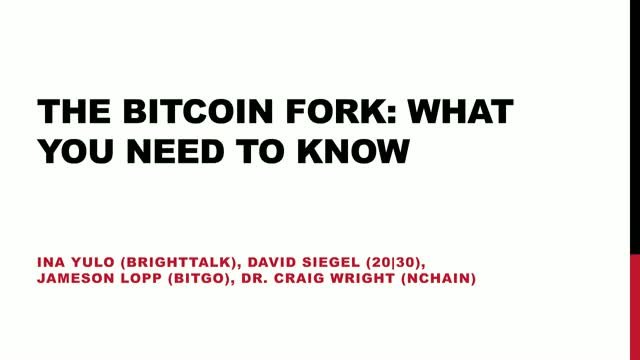 Join this session where an expert panel of bitcoin investors, engineers and entrepreneurs will discuss what you need to know about the bitcoin fork, the current situation of the market, the impacts of the hard fork, and their predictions for the future. They will also take audience questions live so make sure to tune in and have your questions ready.